Stan Smith: Son, if you ever get captured by any terrorists in the neighborhood and end up on Al-Jazeera, just blink you location in Morse code. I'll have a bomb dropped on your location immediately. Steve Smith: But, Dad, then I'd get killed too. Stan Smith: Ah, come on son, there are plenty of kids to play with in heaven. Your cousin Billy. That little girl from Poltergeist. She must be about 16 by now. You could totally tap that. When Seth MacFarlane's Family Guy�a show never known for being politically correct�was dropped by Fox he took out his creative hostilities by creating American Dad!, along with Mike Barker and Matt Weitzman. The new show, another animated series, took sharp aim at right-wing conservatives with a lead character who is a gun-crazy, flag-waving CIA agent so hellbent on preserving overall American freedoms that he has no problem trampling on individual rights, including his own family. I'm no shrink, but it seemed the equivalent of one of those "show me on the doll where the person touched you" scenarios, with MacFarlane broadly attacking the ever-tightening vise of a we-know-what's-good-for-you government. And this well-placed attack almost blew up MacFarlane's face due to the revival of the previously canceled Family Guy. With both shows set to air on Fox, the Internet was filled chatter that American Dad looked like a cheap rip-off of the Griffins, that it would have the same type of jokes, same type of family, etc. So instead of being greeted with a big ol' welcome back for the new series when it debuted in February 2005, the praise seemed to go to the return of the more familiar Family Guy, and if the fickle emotion of message boards at the time were any indication, the general buzz was that maybe MacFarlane had spread himself a little thin. With this three-disc set containing all thirteen episodes of the 2005 season, it is a little easier to separate the show from MacFarlane's more famous creation, especially considering the two aired back-to-back, which made those compare and contrast arguments almost mandatory. And it's certainly worthy of a second look if, for some odd reason, as a Family Guy devotee, you bailed on this series just because it seemed to be a clone. Why? Because it's funny stuff, that's why. (It's possible to like different brands of beer, even though basically they're all made with the same general ingredients.) The reason is that sometimes the slightest variation is enough to make something stand alone, and MacFarlane diverts from the original's random sight gag approach to comedy enough so that the plots here go more for a kick in the crotch of what is perceived as our dwindling freedoms. The family structure of American Dad is led by Stan Smith (voiced by MacFarlane)�the square-jawed, misogynistic, homophobic, bigoted government agent�married to the loving Francine (voiced by Wendy Schaal), a woman who endures a heaping of near-constant verbal abuse with a fairly strong will of her own. Their two teenage kids are nerdy-but-moderately-confident Steve (voiced by Scott Grimes) who is often the source of mangled bonding moments between father and son, and liberal, sexually active daughter Hayley (voiced by Rachael MacFarlane), a constant thorn in the conservative side of Stan. And instead of Family Guy's talking baby and talking dog, MacFarlane augments the Smith family with an effeminate, snack-food-loving alien named Roger (straight from Area 51), who sounds like Paul Lynde (another Seth MacFarlane voice), as well as a horny goldfish named Klaus (Dee Bradley Baker), a botched secret experiment where the fish received the brain of a German Olympic skier. The core of humor is the over-the-top patriotism of Stan Smith, an element that reaches a comedic peak during the two-part season ender, Stan of Arabia, where the family ends up stationed in Saudi Arabia after a horribly botched party of a CIA boss. The ensuing culture shock for everyone involved (Smiths and Saudis) represents some of the most polished and acerbic writing of this 13-episode block. There are no Family Guy "that was like the time..." gags to divert into random bits, and the writing here isn't shy about making Stan a rather unlikable clod prone to shoot-and-accuse first, where even religion (Deacon Stan, Jesus Man) becomes nothing more than a competitive game. And despite the iffy leanings of all those message board posters, each episode actually delivers plenty of sharp political barbs, as in Homeland Insecurity, where Stan is convinced some new neighbors are terrorists and he goes to great lengths to prove his point. While it might seem like a case of overanalysis by picky fans, the reality is that the differences between MacFarlane's two shows were big enough to set them apart, if you are willing to bend a little. Both of his series feature MacFarlane voicing the lead character, both feature peppy sing-along-type theme songs as well as a pair of unusual secondary characters, and of course there is the humor (such as Stan staging "bum fights" in Threat Levels), poked like an infected needle right into the eyeball of conservative values. I'm all for that. Image Transfer Review: All thirteen episodes are presented in their original 1.33:1 aspect ratio, and the transfers don't show any of the problems found on MacFarlane's Family Guy releases. No sense of jaggedness at all, and the eps are clean, with no trace of dirt or debris. Colors look exceptionally bright and vivid throughout. Audio Transfer Review: The English-language 5.1 Dolby Digital surround track is very full-bodied, with a nice sense of directional movement. Voice quality and music cues comes across crisp and clear, and the presentation is first-rate on all points. Extras Review: The three discs are housed in thin-line Scanavo cases inside a thick cardboard slipcase, with two of the discs single layer and the other dual. Each of the 13 episodes are cut into five chapters, with optional subtitles in English, Spanish or French. Lots o' commentaries here, with all but one of the episodes (Threat Levels) receiving one. The tracks feature a rotating cast consisting of combinations of Mike Barker, Matt Weitzman, Dan Vebber, Steve Hely, Albert Calleros, Rodney Clouden, David Zuckerman, Nahmatchka Khan, John Aoshima, Chris McKenna, Seth MacFarlane, Brent Woods, Ron Hughart, Rachael MacFarlane, Jeff Fischer, Pam Cooke, Caleb Meurer, Rick Wiener, Kenny Schartz, Dave Hemingson, Mark Douglas, Matt Fusfeld, Carter Bays, Craigh Thomas, and Anthony Liol. Co-creators Barker and Weitzman are the only ones who show up on all 12 commentaries, and the content is the kind that should slip into the wheelhouse of fans, with plenty of trivia (Klaus the goldfish was originally intended to be French), recounting censorship struggles and general insider nuggets. All of the remaining extras are found on Disc 3, beginning with All in the Family: Creating Family Guy (20m:33s). This is a concise look at the show's origins and development of characters, all from the mouths of Seth MacFarlane, as well as cast, writers and directors. How's Your Aspen? : American Dad Performance at HBO's 2005 Comedy Arts Festival (25m:46s) offers a live read of the episode Smith in the Hand, with the cast lined up in a row onstage reading from the script. This actually uses a cross between the live read and the finished version. Secrets of the Glass Booth (05m:31s) addresses the voice talent, while American Animatics (14m:12s) offers comparison of the rough animation with the finished product. Next is Episode 2: Threat Levels Table Read/Animatic Comparison, with the option to toggle between live read, final version, and animatic, a set of 42 mostly censor-related deleted scenes (17m:35s) and a mock propaganda film entitled The New CIA (03m:08s), with Stan showing off an insider's look, presented in nonanamorphic widescreen. 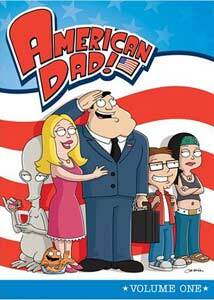 Also included are a pair of promos, one of American Dad! 's Super Bowl Pre-Game Promo (01m:35s) and another featuring the Family Guy "Bored" promo (:33s). I know a lot of Family Guy faithful look down their nose at American Dad as MacFarlane copying a little too liberally from himself. I'll admit it was strange to have the two shows butted up together, because their surface similarities foster those very vocal fan comparisons. Despite their perceived similarities, the shows are really quite different, and there is still quite a bit of very funny comedic boundary-pushing going on here. This three-disc set of 13 episodes has some great non-PC laughs, and that never goes unappreciated around my house.